Calgary Rants: Theoren Fluery's Book Tour? As a child of the 80's, you know you are starting to get old when all of your hockey hero's have almost all retired. The players that you watched growing up actually GOT old ( I am only 32...) and realized that they have to hang up the skates. As a kid, I idolized players like Mark Messier, Gretzky, Mario Lemieux and even Calgary's favorite son, Theoren Fluery! Theo never really "retired" however, as he was kind of suspended indefinitely under the NHL substance abuse program. Theo was an icon in Calgary and still seems to commands the media's attention at his will. 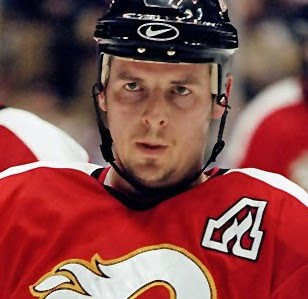 Old Theo sure caused a ruckus in Calgary when his not-so-flattering comments where published when former teammate, Jerome Iginla, broke the Calgary Flames all time scoring record. As usual, the Calgary Flames and MSM crew seemed to pull it all together and the mess got all cleaned up. Fluery once again pulled his media magic this weekend to announce that he is considering making a return to the NHL! Now, Theo is 41 years old and has not played in the NHL since 2003. I know he is probably in great shape and has his "life together" now etc. etc....but based on Theo's past media stunts, I think this move is all about promoting his new book! Theo has played this game before with the media ( remember his stint as a Calgary Viper baseball player...) when he wanted to promote his new clothing line. I would not be surprised if this whole "comeback" story is tied to the promotion of his book! Boy from challenged background overcomes physical/financial obstacles and makes it to the NHL. Nobody gives this gent a chance in the NHL, due to his size. Chap turns out to be one of the great NHL players of his generation. Player's demons catch up with him and he is suspended from the league. Fast forward 7 years later, player is clean/sober and makes NHL comeback at 41 years old! I bet there is already a movie deal in the works! Theoren, I am glad that you have your life together again and I am sure that all of Canada is pulling for you. But sir, you really have nothing to prove to anyone. You will always be an icon and an inspiration to a generation of smallish players who dream of playing in the NHL. What will be disappointing however, is the way the public will react if they realize that this comeback attempt is nothing more than an early book promotional tour. I can see this playing out as follows: Theo is reinstated by the league. Theo is invited to the Calgary Flames training camp. They realize he just does not have it left in him, but they sign Theo to a one day contract anyone. Theo plays one game with the Flames and gets to take his "retirement" skate around the Ice following the game. Tears well up in everyones eyes...and then we all get back to reality. Oh...and Theo sells a ton of books in the fall.